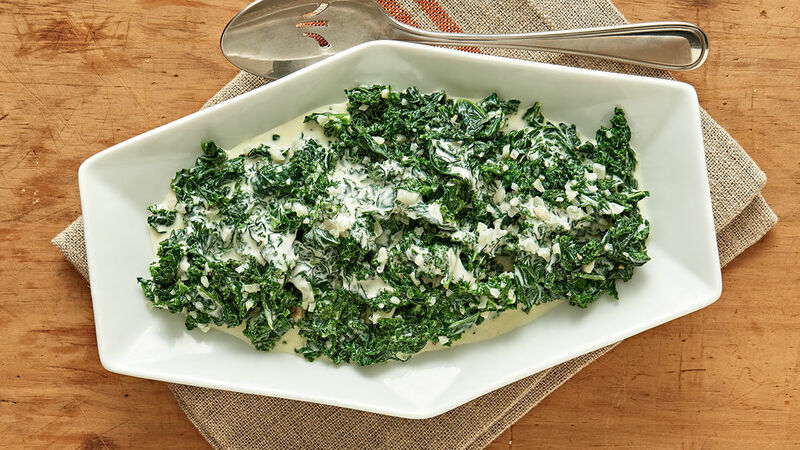 Update the classic steakhouse side of creamed spinach with the more hearty, robust texture of curly or Tuscan kale. It pairs perfectly with steak, of course, but it’s also delicious with this roasted rack of lamb. Add 1 Tbs. salt to a large pot of water, and bring to a boil. Blanch the kale, stirring occasionally, until just tender, about 5 minutes. Drain and squeeze out excess water. Melt the butter in a medium saucepan over medium heat. Add the shallot, and cook, stirring, until starting to soften, about 3 minutes. Add the garlic, and cook, stirring, until fragrant, about 30 seconds. Add the cream, and bring to a gentle simmer. Cook until thick enough to just coat the back of a spoon, 3 to 5 minutes. Add the kale, and toss to coat well. Remove from the heat, and stir in the Parmigiano. Season with 1/2 tsp. salt and 1/4 tsp. pepper, and serve.